St. Marcellinus & St. Peter: The evidence for their cult is early and strong, consisting of feasts in the sacramentaries and calendars, the survival of their tombs, and some verses by Damasus. They are also mentioned in the Roman Canon. Little is known about them, but they were held in great veneration at Rome. Pope St. Damasus says that he heard the story of these two martyrs from their executioner, Dorotheus, who became a Christian after deaths. Marcellinus, a priest, and Peter, an exorcist, were arrested after Diocletian proclaimed his edict against Christian clergy. The two Romans saw their imprisonment as an opportunity to evangelize and converted their jailer and his wife and daughter. The jailer and his family were then crushed to death while Marcellinus and Peter were led to the forest and told to clear brambles from the place of their execution. They were beheaded secretly so that their bodies wouldn’t be venerated. The executioner, however, divulged the location of the bodies to two Christian women who buried them. Their names appear in the first Eucharistic prayer and Constantine built a basilica over their tomb. 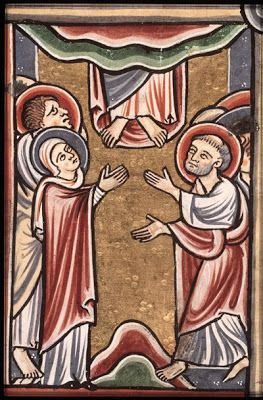 In 827 Pope Gregory IV sent their relics to Einhard, former secretary and biographer of Charlemagne, to enrich his monastery at Seligenstadt; records of the miracles which then took place survive. Their feast on June 2. 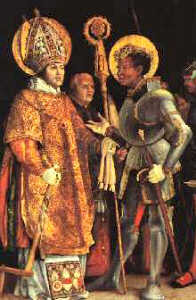 St Erasmus: Erasmus was also known as Elmo. He was the bishop of Formiae, Campagna, Italy, and suffered martyrdom during Diocletian’s persecution of the Christians. He once fled to Mount Lebanon during the persecution and lived a life of solitude there for some time, being fed by a raven. After the emperor discovered his whereabouts, he was tortured and thrown in prison. Legend claims that an angel released him and he departed for Illyricum, eventually suffered a martyr’s death and was one of the Fourteen Holy Helpers. Legend records that when a blue light appears at mastheads before and after a storm, the seamen took it as a sign of Erasmus’s protection. This was known as “St. Elmo’s fire”. The blue electrical discharges under certain atmospheric conditions have also been seen on the masks or riggings of ships. Erasmus is also invoked against stomach cramps and colic. This came about because at one time he had hot iron hooks stuck into his intestines by persecutors under Emperor Diocletian. These wounds he miraculously endured. O God, Who by the preaching and miracles of blessed Augustine, Thy Confessor and Bishop, didst vouchsafe to shed upon the English people the light of the true faith: grant that, thought the intercession , the hearts of the straying may return to the unity of Thy truth, and that we may do Thy will with one accord. Through Jesus Christ, thy Son our Lord, Who liveth and reigneth with thee, in the unity of the Holy Ghost, ever one God, world without end. R. Amen. We beseech You, O Lord, that this sacrificial gift, which we offer in commemorating the death of Your blessed Martyrs, may loose the bonds of our sins and bestow upon us the gifts of Your mercy. We offer Thee this sacrifice, O Lord, on the solemn feast of blessed Augustine, Thy Bishop and Confessor, humbly entreating that the sheep which are lost may return to the one fold, and be nourished by this food of salvation. Through Jesus Christ, thy Son our Lord, Who liveth and reigneth with thee, in the unity of the Holy Ghost, ever one God, world without end. R. Amen. We who have been filled with Your sacred gifts, humbly pray You, O Lord, that, what we celebrate as an act of our bounded duty, we may feel in the increase of Your saving grace. We who are refreshed by this saving Victim humbly entreat Thee, O Lord, that though the intercession of blessed Augustine pleading for us, It may continually be offered in every place to the glory of Thy name. Through Jesus Christ, thy Son our Lord, Who liveth and reigneth with thee, in the unity of the Holy Ghost, ever one God, world without end. R. Amen.